Shark Boy (still haven't renamed him for blog purposes), turned 10 this summer. He invited a herd of boys over for a Camp / Outdoor themed party. Here are some photos, for those of you who scan for party ideas! The dessert table. Lanterns we use for camping, a wooden bowl and a tin bucket with bait (Swedish fish) were perfect accents. 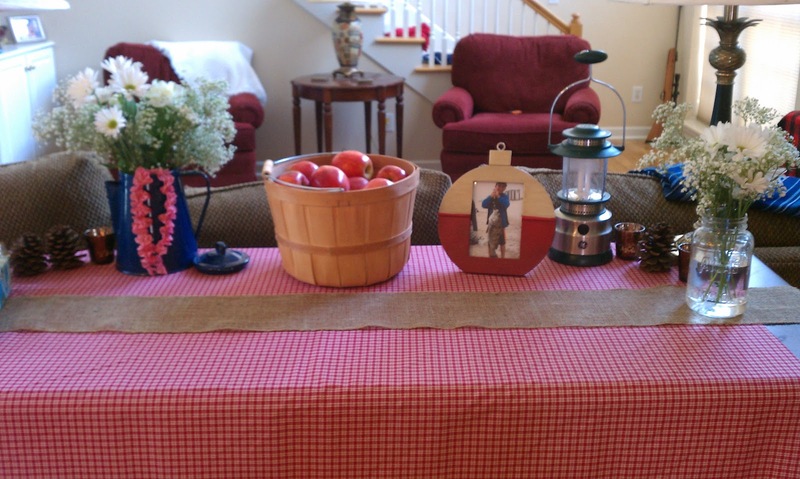 I did a lot with rolls of burlap and gingham and plaid - just unfinished pieces of fabric. I put daisies in Mason jars and in my blue enamel camp coffee pot. 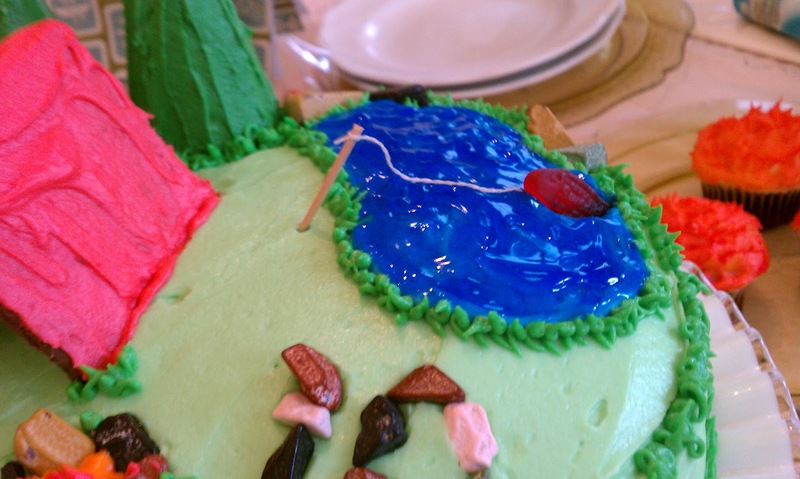 The cake was chocolate with chocolate ganache filling, graham crackers for the tent, sugar cones for trees, candy rocks for the fire pit and the '10', and a lake of blue gel icing, which fortunately tastes good! You have to have cake pops, right? On the campsite cake he is standing beside his tent. That is a photo I took of him hiking in The Garden of the Gods in Colorado. I printed it on regular photo paper, cut it out, and stuck it right in the icing. 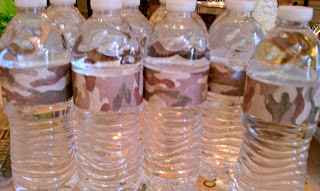 Above - water bottles and Hersey bars wrapped in camp theme craft paper. He was helping me hang decorations on the pergola and looked at me and said, "You didn't have to do all this." I assured him I did because I love him and it makes me happy to create a great party to celebrate one of the greatest days of MY life - the day this sweet child was born. After it was over he hugged me and said he really appreciated his party and thought it was completely awesome. Oh - I'm going to have to post bigger photos. Sorry y'all. I'll fix that when I get a chance! The party looks like it was a blast! Thanks Neen! The boys had lots of fun!! So you are basically the coolest Mom on the block. 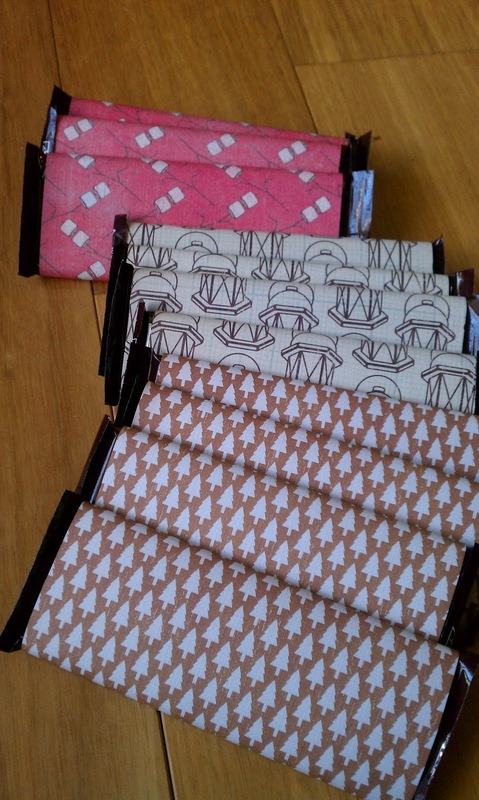 You know I have to pin these right? Impressive! Love all the details all the way down to the picture of him hiking on the cake. Glad you are blogging again! Love this party and all the details you have put into it. Those campfire cupcakes are awesome...a particular fave of mine! !